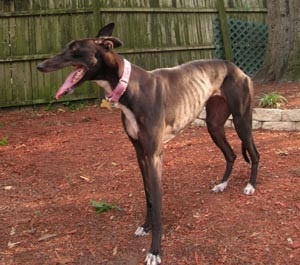 Greyhound Pets of America - South Carolina has finally posted pictures of Ana's sister!! She is just gorgeous- Ana and Auroa are twins!!! 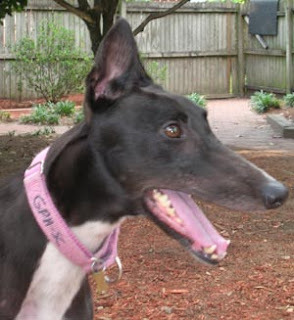 I really want to adopt her, but GPA-SC said that they only adopt to residents of South Carolina and people just over the borders of Georgia and North Carolina. 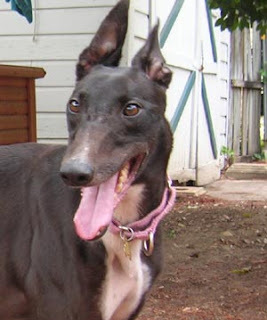 I still haven't been able to convince Kenney that we need another greyhound (apparently, he doesn't believe that we need to adopt 3 greyhounds in less than a year). But Auroa would make a perfect addition! Auroa has Ana's eyes & ears!! Look at those lines- just like her sister's! !